Eager to move forward, the MSG150 crew headed out for our third trip to the UFC this week. We are done with the Uwajimaya Deli portion and are moving on to the private establishments along the north side of the food court. First stop, Shilla Korean BBQ. With the loss of Blue & Pink, Shilla is (I think) the only remaining Korean spot in the DLZ. There always seems to be a crowd in the UFC and today was no exception. Luckily Shilla's has a couple of its own tables and we were able to snag one for our group of five. I was very glad to be through with the Uwajimaya Deli. 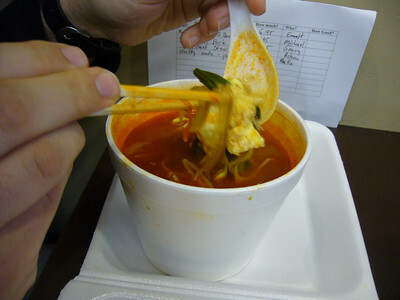 It was mostly better than I had expected, but still on the low end of ID lunch quality. 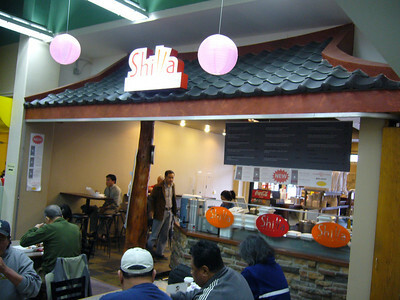 Shilla's is the first spot on the north side of the food court. For a stall in a food court, Shilla's has done a nice job of dressing itself up. It has a tile rooflet, stone wall, and a log post. There were a couple of people in front of us, but the line moved quickly. The friendly woman behind the counter was very efficient in taking orders and passing out food. 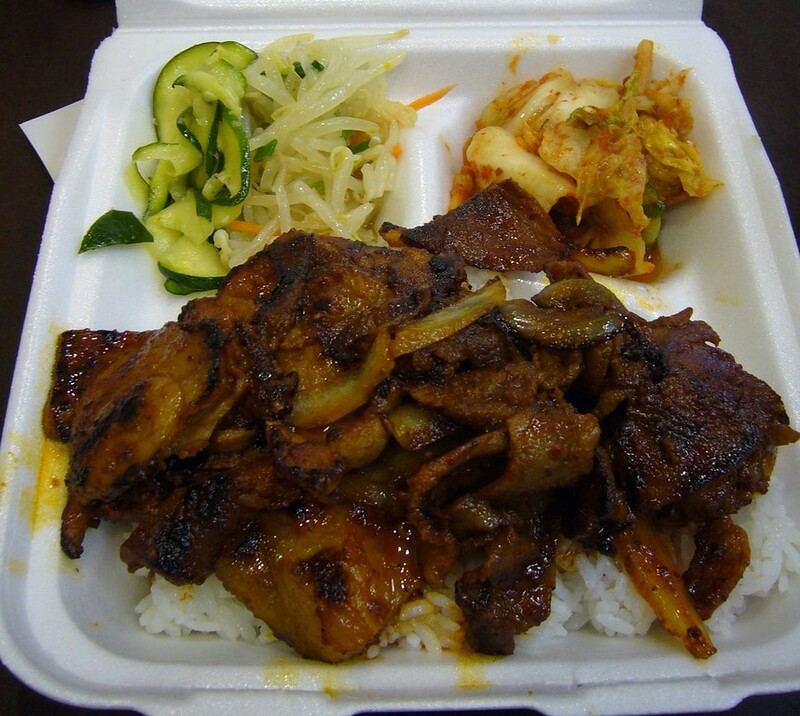 I ordered the Spicy BBQ Pork which came with two sides of Kimchi, white rice, and a huge pile of BBQ pork. It was excellent. The best meal so far at the UFC. The pork had a nice spice to it and was well flavored. With the spicy, tangy kimchi and rice it was a great lunch. I also tried a shorty can of pear juice. 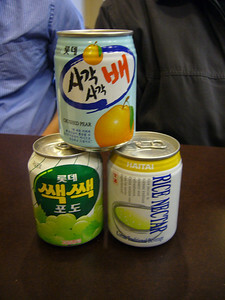 It tasted a bit like canned fruit cocktail juice with pear pulp in it. Not horrible, but not something I'd buy again. Still not enough to ruin a solid four chopstick lunch. 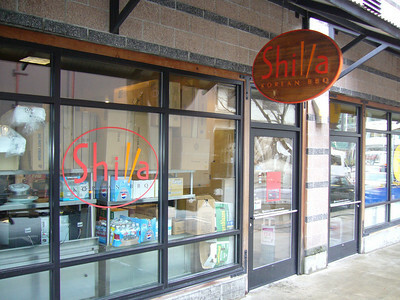 Shilla's advertises that all food is cooked to order, and has a large variety of Korean dishes. 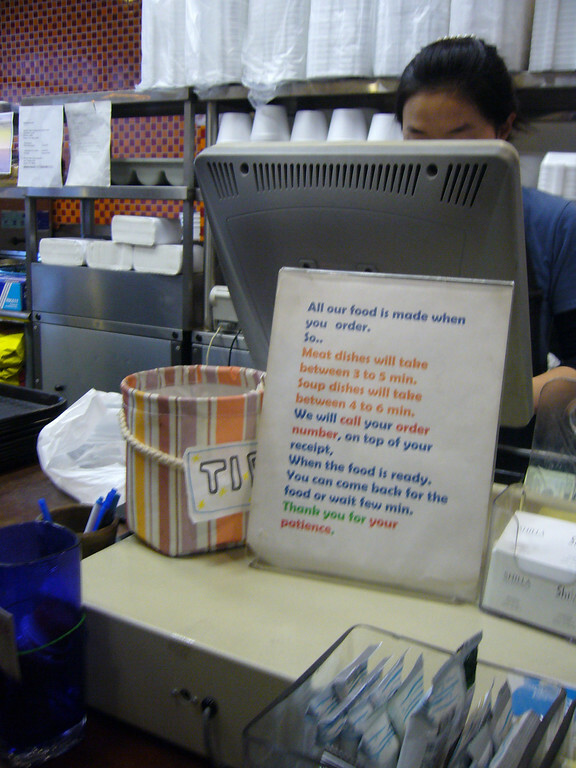 I'm very partial to Bibimbop, ever since falling in love with it at Blue and Pink - now closed. Blue and Pink had the Stone Bibimbop on their specials board every day, and it was literally some of the best lunch food I've ever tasted anywhere. 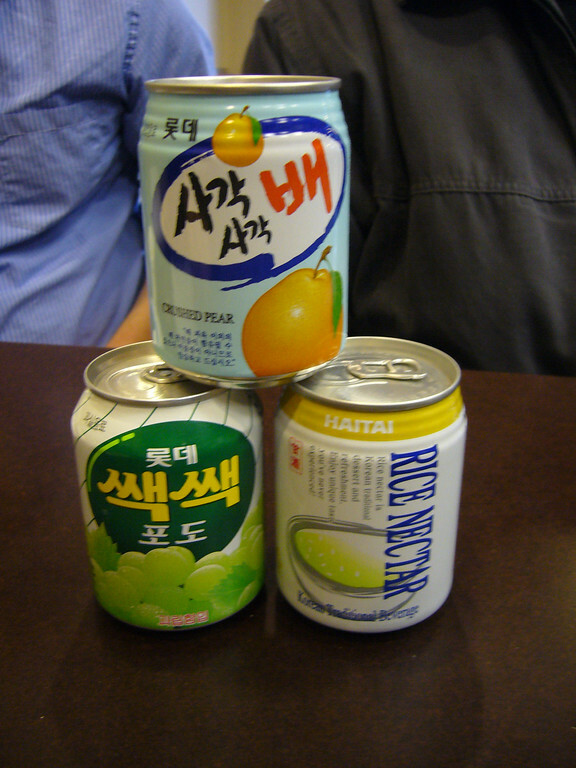 Alas, they're gone, hence we're at Shilla's. I order the Bi Bim rice, we'll see how they do. Their version is quite good. 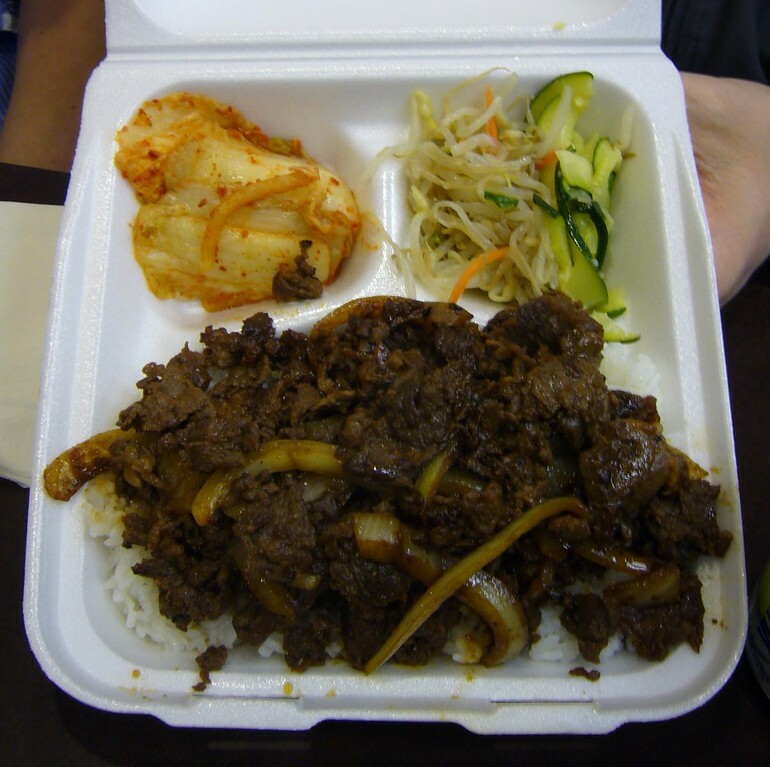 It comes in styrofoam, not stone pot, and the egg is scrambled, not fried, but the excellent commingling of flavors are there - there's the sauteed greens, good beef, some bean sprouts, that delicious Korean hot sauce, and a side of kimchi. 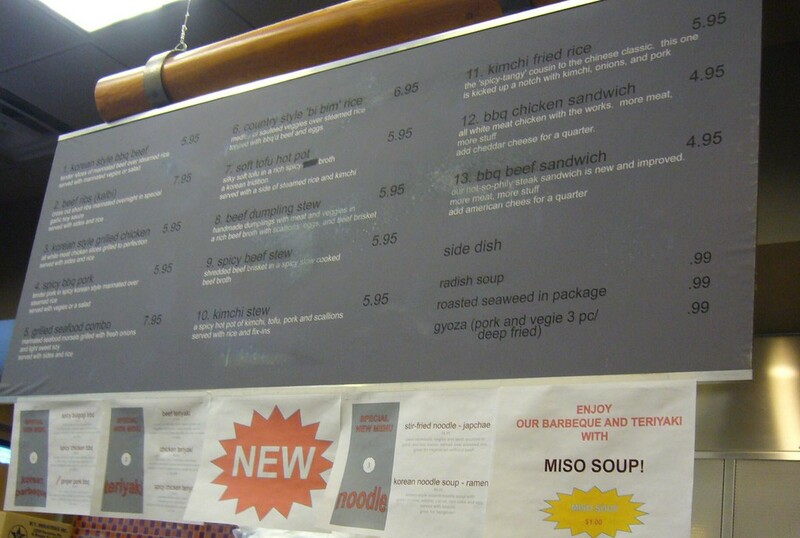 The lady kicked in some Miso Soup for free, which was nice. To drink, I got some grape flavored drink. I think it's called SacSac juice, and the web site claimes "it has a unique taste of chewing full sacs." 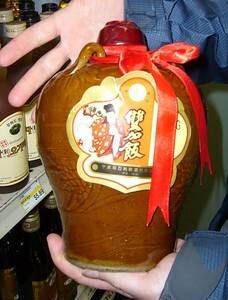 It was sweet and tasty - and true to it's name, it had some SacSac floating in it. As you drink, you have little grapes trying to pop into your mouth. This guy writes a much more detailed review. I agree with him. I got some "Chimes Ginger Chews" as my interesting choice from the market. They're from Indonesia, and made with Peanut Butter. I like Ginger Ale, and Ginger with my sushi, but this was just bad. Plain bad. It did not "instantly transport me to a happy place." Other people liked it though. 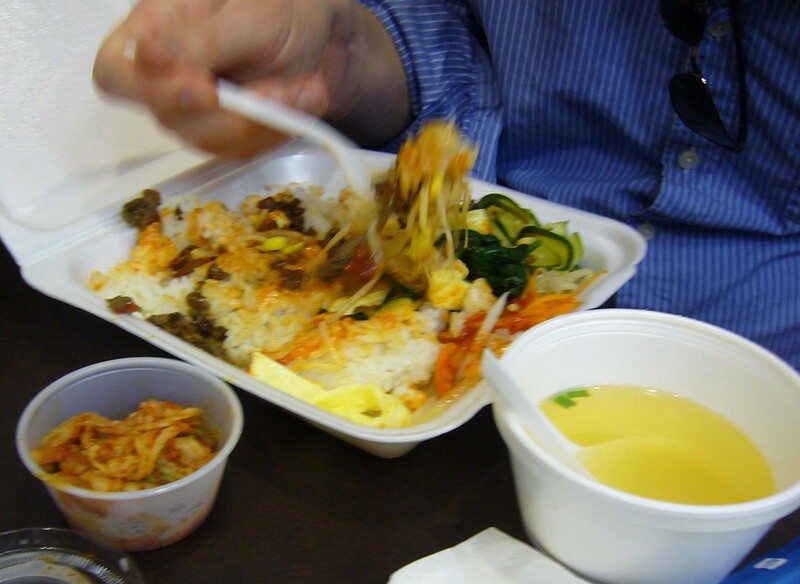 By the way, if anyone knows where I can get good Stone Bimbimbop in Seattle, please let us know! Korean food is rare in the Internationl District, so I wasn't sure what to expect. The menu had a bunch of stuff that I was totally uninformed about, and I went with the dish that had three words that I understood in it: Spicy Beef Stew. The soup was served piping hot. It took a good 10 minutes before it was at an edible temperature but once it cooled down, I definitely liked it. The stew was full of lots of good stuff: noodles, big bean sprouts, and some vegetables. The beef was a little sparse and not as tender as it could be... but not noticably so. The dish also came with some sides: rice, vegetables, and kim-chi (on request). The rice was pretty sticky and easy to eat. I'm not actually sure how they cooked the vegetables, but they were really good. The kim-chi was... kim-chi: good, but still a big pile of fermented cabbage. A good amount of food for $6. When you're ready for a change in the ID. I stood in front of the Shilla hanging menu, going through the options one by one, looking for something vaguely vegetarian. The Kimchi Stew sounded good if they could make it without the pork. 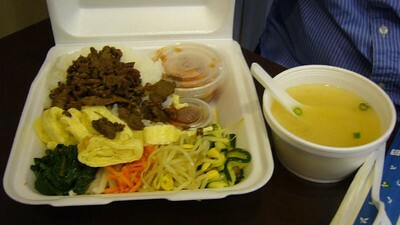 They claimed the Japchae noodle dish was a great vegetarian option without the beef. There was also some sort of ramen noodle soup. I asked about the kimchi stew, but the pork was too intrinsic to the dish, as it turned out, and so I went with the beef-less japchae. Plus another buck for a cup of miso soup. After Chef Kenzo and the steam table, it was nice to have a freshly cooked lunch. The styrofoam container I eventually received was quite heavy, and it looked like they given me a huge helping of noodles, but no, it was an almost but not quite big enough helping of noodles over a bed of rice. It came with what seemed like one piece of kimchi (the pork-less variety, I hoped) and something else that I've already forgotten. The japchae, which consisted of thin glass noodles and some vegetables, was pretty good. Two very short sections of noodle were hard, but they were small and easy to work around. It does seem a little odd to me to give both Shilla and the steam table three chopsticks, because I think I liked the Shilla UFC experience a bit better, but that's the way the fortune cookie crumbles, I guess. There is a staple lunch item around here: Rice and Meat and Vegetables. Or you can really mix things up and have Meat and Vegetables and Rice. But in the end it all starts to seem the same. So did my Korean Beef BBQ differ from anything else I've had this month? Not so much. It was tasty Meat. With some Rice. And a bit of Veggies. And the quality was good and it was fresh and hot, but really it was the same darn thing that everyone else has too. I was sitting there eating my RMV and thinking about what I could really say about this lunch choice that we have said about a dozen others. I couldn't come up with much. And then I looked across the food court to 'Made to Order' and started thinking about how much better the Beef Sukiyaki was. Sure its just another RMV but something about it was just so much better than this. So, 3 stars for this place, its good, but this dish isn't all that. Eat the Sukiyaki across the aisle.